Herbs are grown for their use in cooking and in healing, some are grown for their fragrance, and some fit into all these categories. 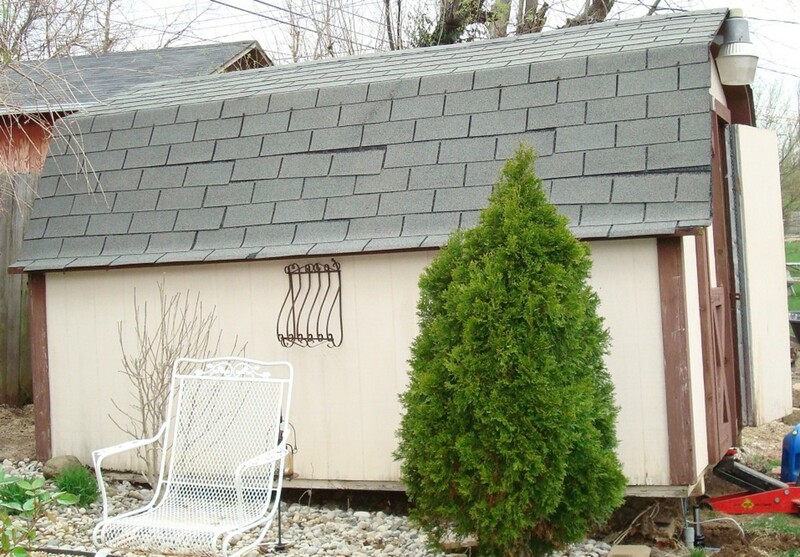 One thing is for certain and that is that aromatic herbs are one of the big attractions of a herb garden. Many gardeners enjoy the wonderful perfumes of herbs such as Lavender (Lavendula spp. )or the citrus-scent of Lemon Balm (Melissa officinalis). I must admit I love to grab some herbal foliage, crush it lightly in my hands, and inhale! What joy! Anyone planning a herb garden should think about what plants they are going to include and amongst the characteristics that lend appeal are definitely the wonderful aromas that herbs give off. 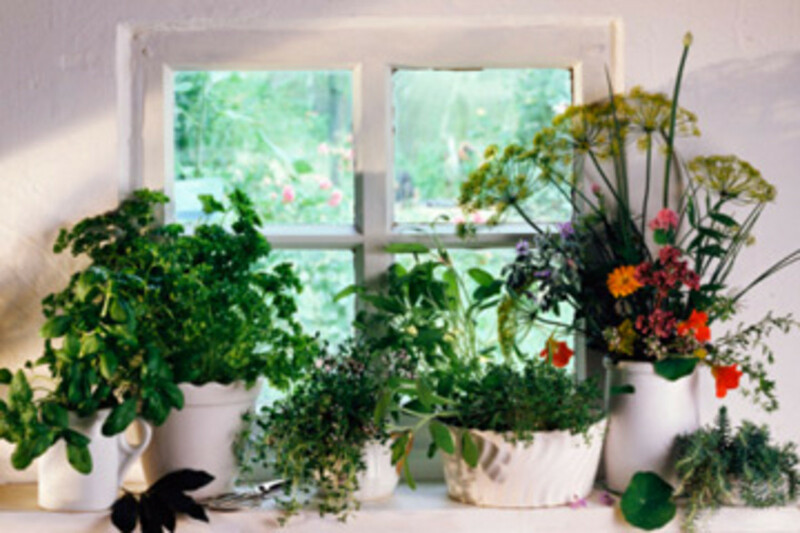 Dried aromatic herbs smell fantastic while they are drying and many are ideal for adding to pot-pourris. 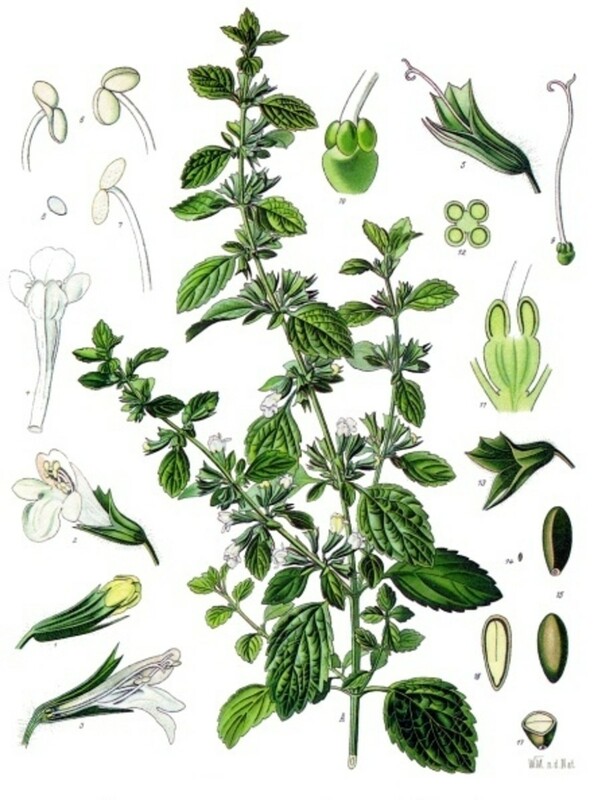 Lemon Balm (Melissa officinalis) illustration. In Public Domain because copyright expired. Lemon Balm is one of my favourite herbs of all. Just crush a few leaves and you will see why. It has a most heavenly perfume very reminiscent of lemons that is is named after. Lemon Balm is another perennial herb that will grow back each year after dying back for the winter months. It forms clumps of foliage that carry its amazing lemon aroma, although its flowers are very insignificant. Lemon Balm is used medicinally as an infusion of the leaves. It is a remedy for nervous tension, insomnia, headache and indigestion. The dried scented leaves can be sown into linen bags and placed under the pillow at night to help encourage a restful slumber. Lemon Balm, as an infusion, can also be added to bathwater. Young leaves of Lemon Balm can add a citrus-like zest to salads or can be eaten in sandwiches. Bruised leaves add their flavour and aroma to dry white wine. 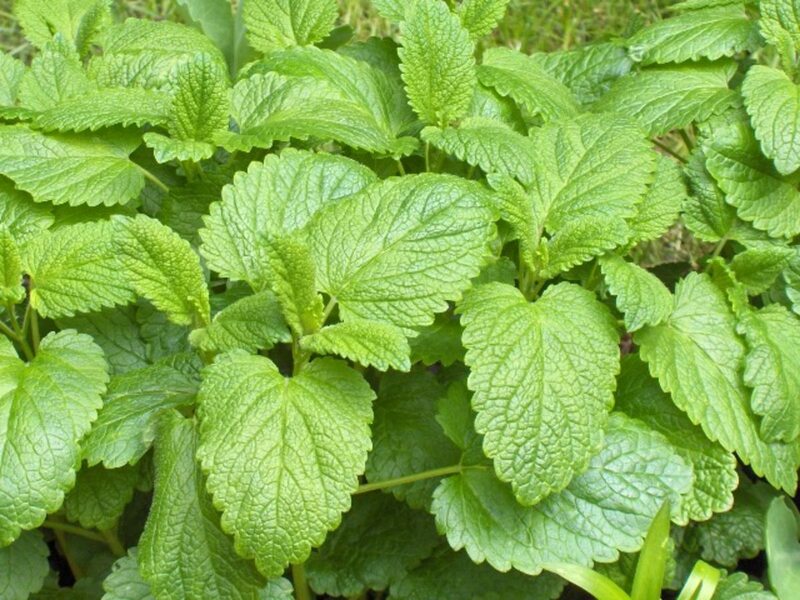 Although Lemon Balm is not a very ornamental plant and its flowers are hardly noticeable it nevertheless is a very useful addition to the herb garden. It is easy to grow and its aroma is heavenly! Fennel is a tall perennial herb which is great for the back of a flower border, or maybe in a clump in the middle of a circular design. It has feathery foliage that smells strongly of Aniseseed when brushed or lightly crushed. The whole plant will release this inviting aroma if bruised slightly. 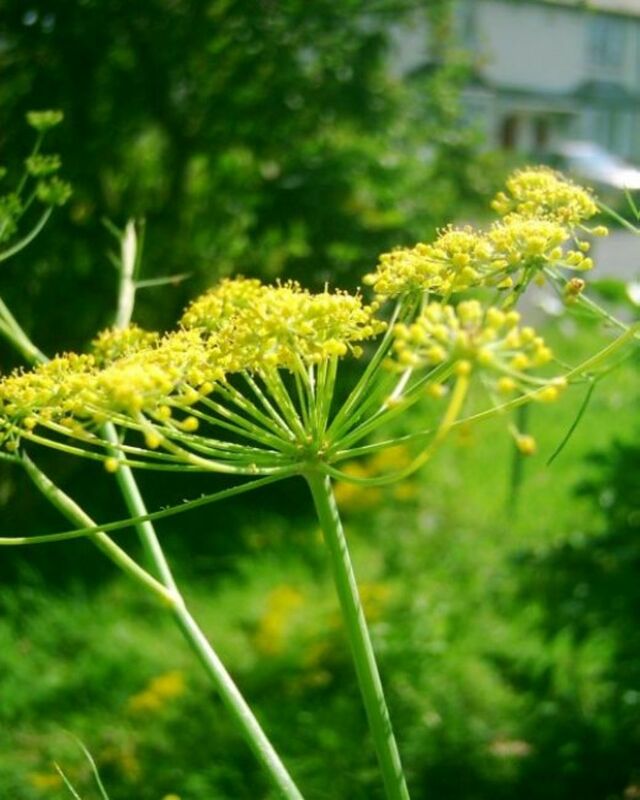 Fennel has clusters of yellowish flowers in umbels at the top of its stalks and these are followed by spicy seeds that are good in curries and other dishes, as well as for making Fennel herbal tea. Fennel is good eaten raw in salads or added to cooked dishes and made into a sauce. It is a really useful herb to grow. Its feathery foliage makes a wonderful contrast to other broad-leafed herbs that are much shorter in height. As a medicinal herb it is good for the digestion and said to be an aid to slimming. Lavender is an evergreen herb that is so popular it probably needs no description. 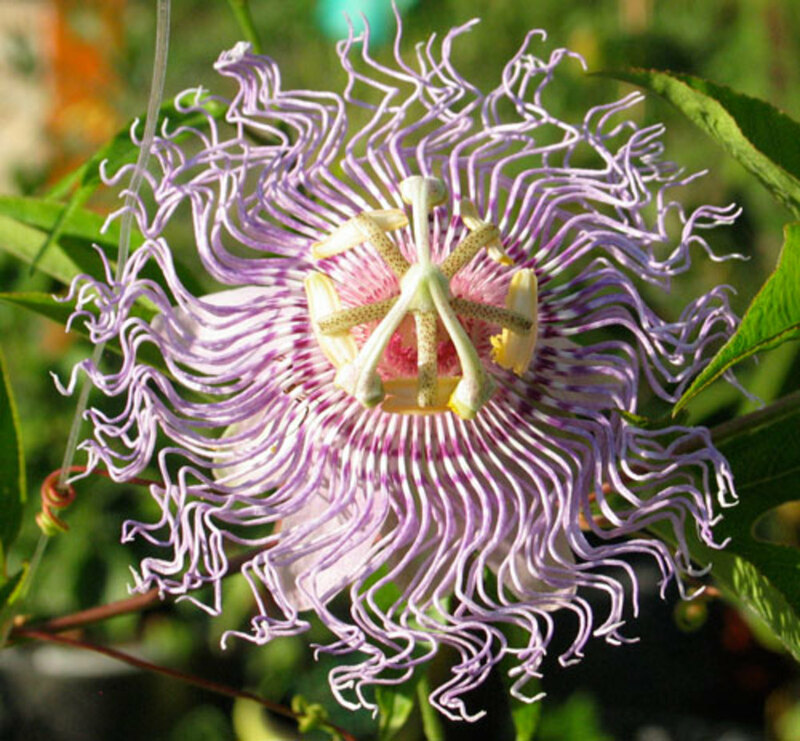 It grows in small bushes of grey-green foliage and carries its lilac-purple or purplish-blue flowers on flowering spikes above. It likes a sunny situation and is a perennial herb that doesn't need that much attention apart from pruning back from time to time. These flowers are collected and dried and they emit their wonderful and distinctive perfume. They were traditionally sold and used in lavender bags that could be put amongst clothes to deter moths and give them a delightful fragrance. 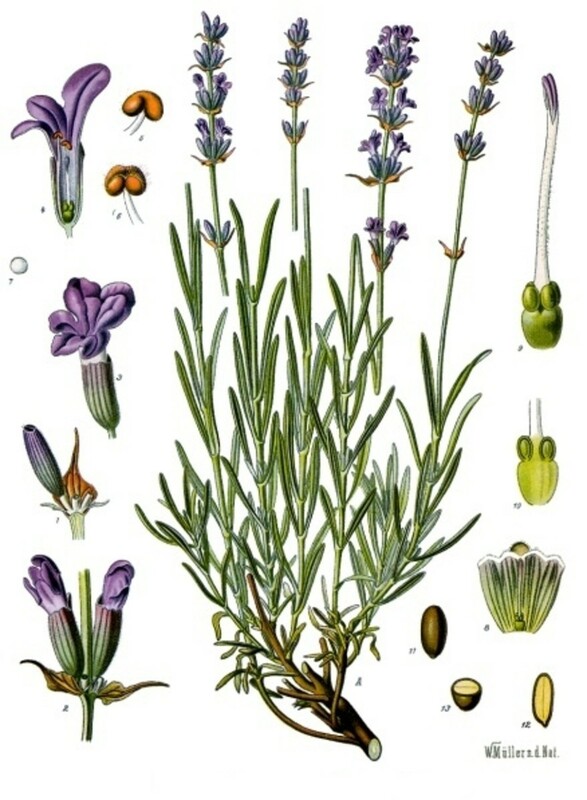 Lavender's perfume is used in Eau-de-Cologne and many other products in the cosmetics and perfumery industries. Lavender is one of the best-known and most traditional of aromatic herbs grown in gardens both for its flowers and its perfume. Chamaemelum nobile. Illustration in Public Domain due to copyright expiring. Chamomile is a perennial creeping aromatic herb with finely-divided feathery foliage and daisy-like flowers. It will grow forming green mats when not in flower and if lightly bruised they give off a wonderful and distinctive aroma that has been likened to being somewhat similar to pineapple but with a more herbal smell. Chamomile, if tended, can be grown as Chamomile lawns. It likes plenty of sunshine and because it is a short plant it should be grown at the front of borders in a herb garden. Chamomile flowers are collected and dried. They make an excellent herbal tea that is both calming and recommended as tonic for the digestion. You can buy pre-prepared Chamomile tea-bags in many places. 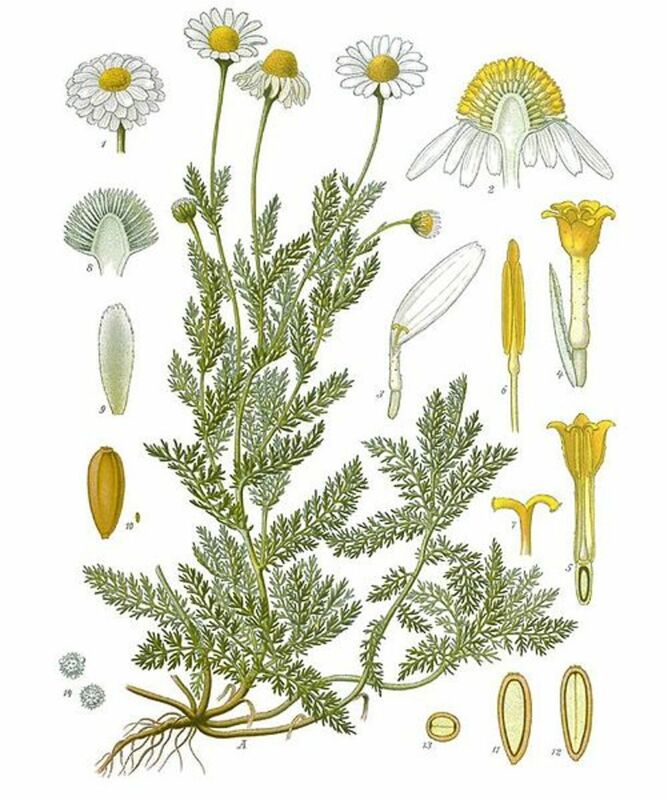 Chamomile flowers made into an infusion are used to rinse the hair with and are said to help heighten its blondeness because of a slight natural bleaching property that they have. Rue. 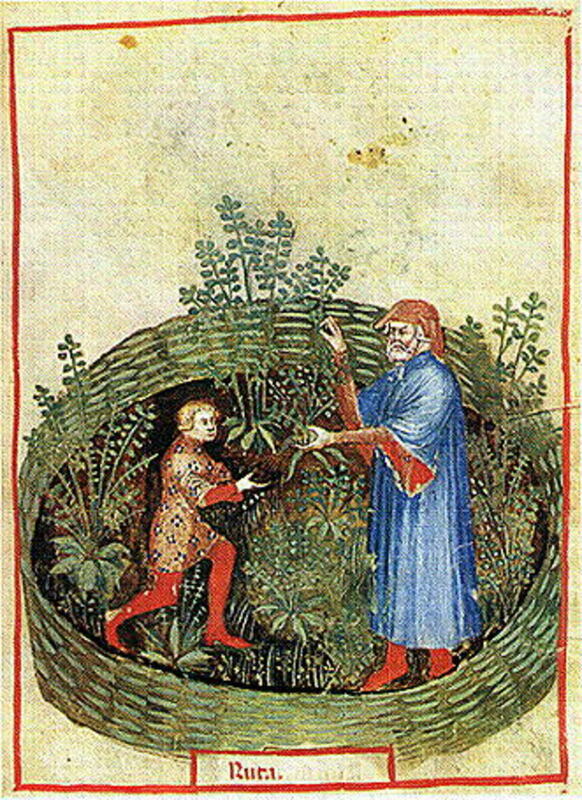 An illustration from the Tacuinum of Paris. In Public Domain. Rue (Ruta graveolens) is an evergreen perennial herb that grows in small bushes with woody basal stems. 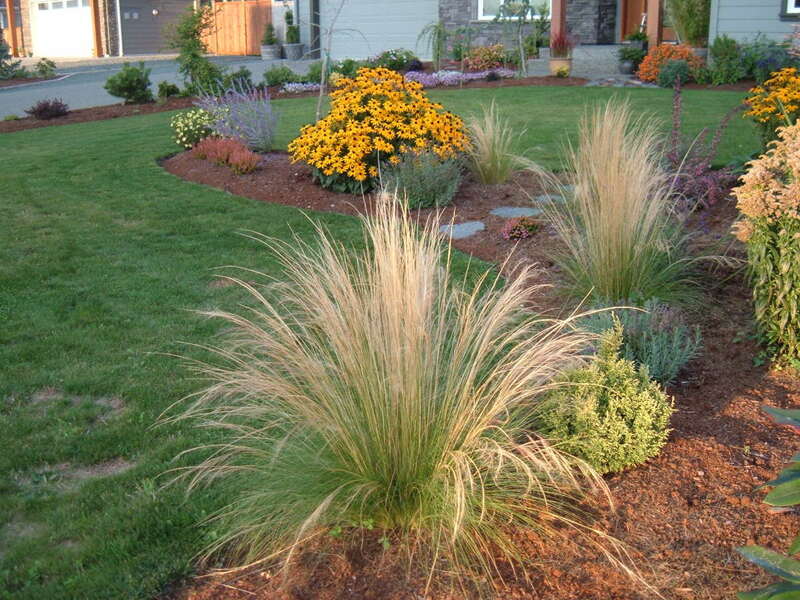 It is grown as much for its ornamental purposes as any other reason. Rue has a very bitter taste and is not used in cuisine at all, although this herb has been utilised on homeopathic and other remedies in herbal medicine, It is employed in homeopathy against varicose veins, rheumatism and arthritis. Rue has grey-green very aromatic foliage and bears groups of small yellow flowers that are carried above. It will form dense clumps and is good for using to form short hedges or dividing up borders. Just brushing the plant will release the very distinctive aroma of Rue. 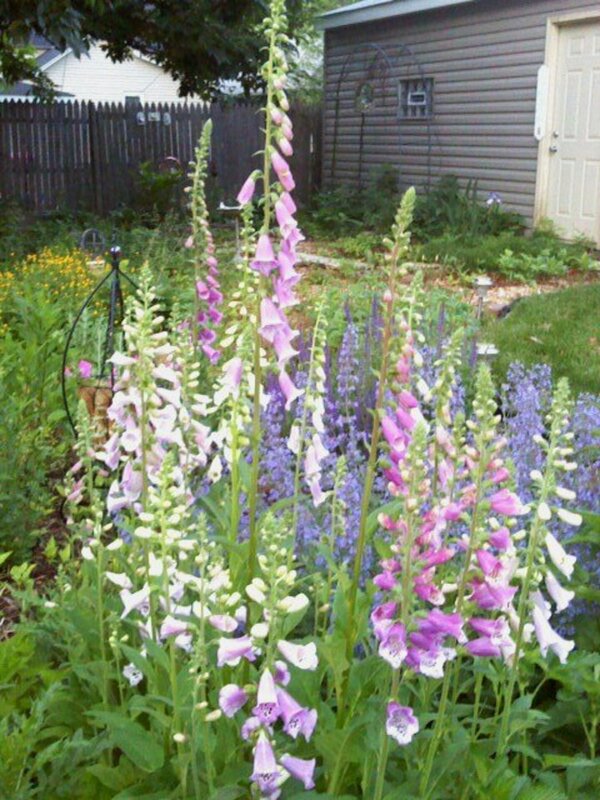 It is a plant you will probably either love or hate but personally I think the smell of Rue is amazing! Rosemary (Rosmarinus officinalis) is another. This evergreen herb will form small bushes of small spiky leaves and tiny purplish flowers. It is easy to root from cuttings and once it is growing doesn’t need much attention. It can be used to form small hedges of aromatic foliage. Dried Rosemary leaves can be added sparingly as flavouring for various savoury dishes and it used in herbal medicine in the form of an infusion. It is said to be good for the circulation, stomach problems and anxiety. Also as a hair rinse and Rosemary oil is used in many cosmetic products and soaps and shampoos. No herb garden would be complete without Thyme (Thymus vulgaris) or Sage (Salvia officinalis). The Simon and Garfunkel hit song Scarborough Fair name-checks both these aromatic herbs in the lyric: "Are you going to Scarborough Fair, parsely, sage, rosemary and thyme..."
These are traditional herbs for the garden and can be used in cooking to add their flavour to many dishes and in herbal medicine too. They are both perennial evergreens. Thyme will form large clumps of its tiny foliage and Sage will grow into small bushes from a woody base. The herb garden is something you can spend time planning but make sure you include plenty of aromatic herbs, the herbs you enjoy for their perfumes as much as anything else! I didn't know that so thanks for pointing it out. You didn't mention that Rue also is very irritation to many people, similar to Euphorbia's , Poisin Ivy, both can cause rashes in many people. Thank you for your great feedback, Ruchira, Au fait, rajan jolly, snowdrops and tamron! 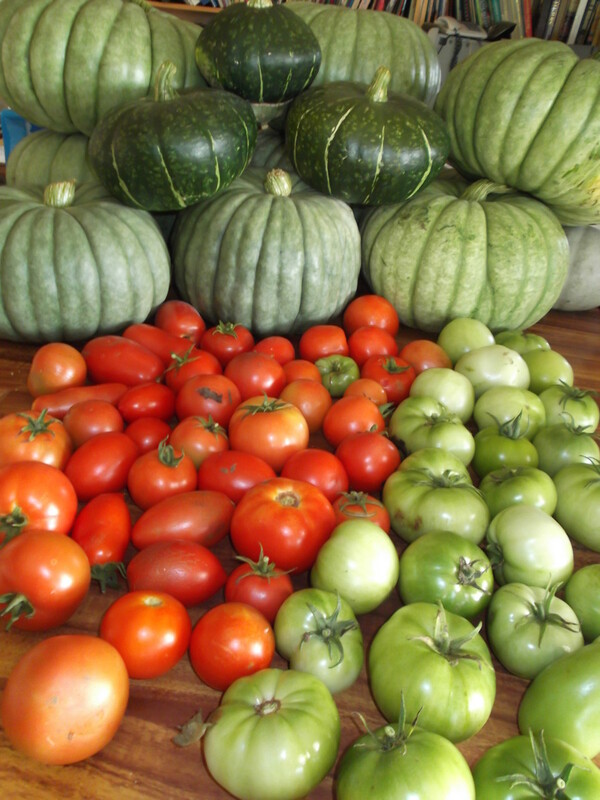 Au fait, yes they can all be grown in containers as long as they are big enough. Hello Greenbard. Very interesting hub, I have seen these plants and I agree that they're very useful to us. A great hub on these aromatic herbs. We use fennel seeds both in cooking as well as a mouth freshner and when it is chewed after meals it helps with digestion. Excellent hub. The lemon balm sounds especially desirable. Too bad there is no scratch and sniff available on here! The rosemary sounds useful too. They all do of course, but some seem more appealing. Do these herbs do well in containers? Voted you useful, interesting, and will share with my followers. I am determined to grow lavender and lemon balm in my garden 'cause of the benefits outlined. Have the rosemary and reap it's benefits.